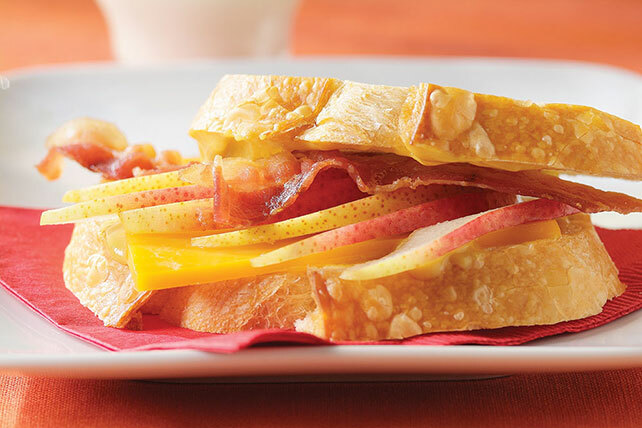 Sweet pear slices bring out the smoky, salty deliciousness of bacon perfectly. Try the pair in this tasty cheddar cheese sandwich. Spread bread slices with mustard; fill with cheese, pears and bacon. Prepare sandwich as directed. Spread outside of sandwich with 2 tsp. softened butter. Cook in skillet on medium heat 3 min. on each side or until golden brown on both sides. Slice the remaining pear to serve with the sandwich.